Simmons 899502 Pro Sport 12x50mm Black Roof Binoculars FREE SHIPPING! Spot targets from further distances with greater clarity using the ProSport Black Roof Binoculars from Simmons. The binoculars utilize high-quality Bak-4 prisms and multi-coated lenses to deliver optimal light transmittance for superior edge-to-edge sharpness. The powerful 10x-magnification offers an impressive 255-foot field of view for quick, on-the-fly target acquisition from any angle. Designed for all-weather use, each optic tube has been nitrogen-purged and O-ring sealed to deliver waterproof and fogproof functionality. A ruggedized rubber armor coating protects the ProSport from impact shocks while also delivering a secure and reliable grip that holds up in wet, icy or dry conditions with or without gloved hands. 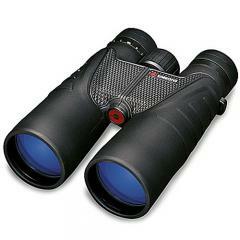 ©2002-2019 CopsPlus.com: Simmons 899502 Pro Sport 12x50mm Black Roof Binoculars FREE SHIPPING!